Once upon a time, cockroach control was a brute force attack. For many years, the standard treatment for cockroaches was to spray smelly, toxic, residual insecticides on baseboards, in cabinets and closets, and on any other surfaces that cockroaches might be expected to contact. Some of the cockroach extermination chemicals used back then had label instructions that required that the insecticides be "applied to runoff," which basically meant that the chemicals were to be sprayed until they were dripping off the treated surfaces. We used to call this the "surround and drown" method of cockroach control. Just in case the "surround and drown" treatments weren't enough, they were sometimes reinforced by aerial assaults. Insecticides like pyrethrum, resmethrin, or DDVP (dichlorvos or Vapona) were dispensed into the air,a practice commonly known as "fogging" or "bombing". The idea was to quickly kill the roaches who took a direct hit by the fog, and to "flush" or provoke the rest to run across the freshly-applied insecticide. Sometimes it worked. More often, it didn't because the liquid insecticides were almost as repellant to the roaches as the fogs were. Fogging had many disadvantages. It was inconvenient, it required extensive preparations (emptying kitchen cabinets, covering food prep surfaces, and so forth), and it used large amounts of pesticides -- some of most effective of which, such as dichlorvos, were also toxic to humans. Depending on the chemicals used, it could also stink up the place for several days. Also depending on the chemicals used, fogging could also be toxic to house plants, aquarium fish, and sometimes other pets. And regardless of the chemical used, any food preparation surfaces or utensils in the treated areas had to be thoroughly cleaned before they could be used again. The fact that some exterminators (and almost all do-it-yourselfers) over-applied the fogs made this even more difficult because over-application left an oily film on exposed surfaces. Finally, to add insult to injury, fogging for roaches really didn't work all that well. Except for dichlorvos, whose vapors were toxic, the fogs didn't penetrate deeply enough into the places where the cockroaches actually lived to be of much effect. As time went on, cockroach treatment became more precise and scientific. Newer insecticides were developed that were less repellant to roaches, and application methods evolved from the old "surround and drown" method to precise application of insecticides directly into cracks and crevices where the roaches actually hid. But the basic idea was still the same: Contact as many roaches as you could during the infestation, and leave enough residual insecticide around that the ones you missed will eventually contact it and die. Nowadays, most cockroach infestations are treated using either gel baits or granular baits that are specially formulated to be attractive and palatable to roaches. The baits contain a variety of active ingredients, but the more important factor is the attractiveness of the bait. If they don't eat the bait, they won't die, no matter how effective the active ingredient is. Cockroach gel baits are usually supplied in either syringes or squeeze tubes and are most commonly used to control German cockroaches or brown-banded cockroaches. They are effective against other cockroach species, but they're more convenient for application in the habitats that German and brown-banded cockroaches prefer. Gel baits are applied in tiny dabs as close as possible to where roaches live and travel, and preferably closer than any other food source. If possible, they should be limited to use in cracks and crevices. If done properly, the success rate is very high, there is little or no odor, and only tiny amounts of pesticides are used. The downside is that control tends to be slow. It usually will take several days for an individual roach to die, and several weeks to kill an entire large roach population. There are many gel baits available for cockroach control. 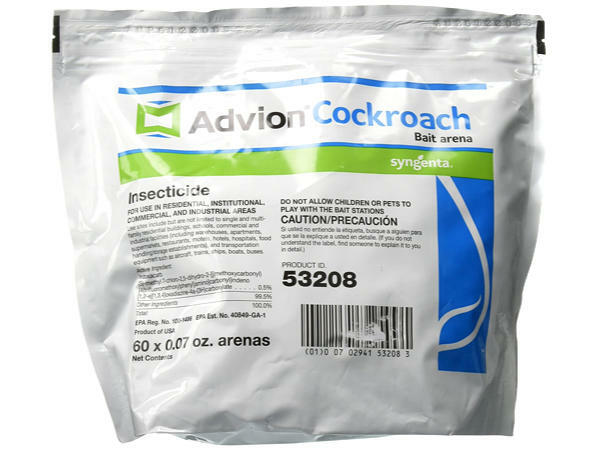 Advion Cockroach Bait and Invict Cockroach bait are two of the better ones. Many professional exterminators use these products in the exact same concentrations and formulations as the versions that can be sold over-the-counter to unlicensed individuals. Granular cockroach baits are usually used against American and Oriental cockroaches. They're usually used in bait trays in areas where the roaches are living. Label permitting, they can also be scattered in crawl spaces and under porches for control of Oriental cockroaches and some other insect species, such as ants and crickets. Cockroach bait stations like those made by Advion and MaxForce are a convenient, but somewhat slower way to treat cockroach problems. They come in several sizes for different species of roaches. For best results, the stations should be placed in areas where there are already cockroach droppings or live cockroaches, and they should be replaced in the same locations. Roaches leave pheromone trails that other roaches will follow to get to the bait. Bait stations are more convenient than gel baits, but they also tend to be less attractive to roaches than freshly-applied baits. If you only have a small roach problem, they may solve it before it becomes a big roach problem. But if you already have a big roach problem, gel baits are likely to get it under control much more quickly. If you decide to use bait stations, make sure to use enough of them. Spacing them every foot or so along a crack or crevice that shows signs of cockroach infestation is a good rule of thumb. As a general rule, I prefer that non-professionals not use dusts for cockroach control. They're more hazardous to use than baits and they're usually unnecessary. They're also repellant and will make baits unpalatable if they settle on or near the bait. But there are a few cases in which using dusts makes sense. One case in which you may want to use dusts is inside large inaccessible voids, such as a crawl space with no entry door that's infested with Oriental or American cockroaches. Dusts travel on air currents and settle out through an area, so they're a good choice for voids that you simply can't get into. Just be sure there are no ventilation ducts or air intakes in the void area, and no gaps through which the dust might get into the living area. I also used to recommend dusts in wall voids in kitchens and bathrooms with cockroach problems, but I no longer do. I've become convinced that dripping some bait inside the wall voids through either drilled holes or existing pipe chases works just as well and is less hazardous. If you do choose to use dusts, there are four basic kinds. The first uses natural pyrethrum from chrysanthemum flowers and is available in various brand names including Drione and Evergreen. The second group of dusts use various synthetic pyrethroids such as deltamethrin, which is available in the trade name Delta Dust. Delta is a good choice where the area being treated is damp because it's somewhat more moisture-resistant. If you want a dust with minimal toxicity, then a diatomaceous earth dust would be a good choice. Diatomaceous earth is a desiccant that scratches the insect's cuticle and causes dehydration, but has no chemical mode of action. The down side is that it's very slow. Another good low-toxicity dust is a boric acid dust like BorActin. Boric acid is one of the least-toxic insecticide active ingredients on the market, and it's slightly faster-acting than diatomaceous earth. 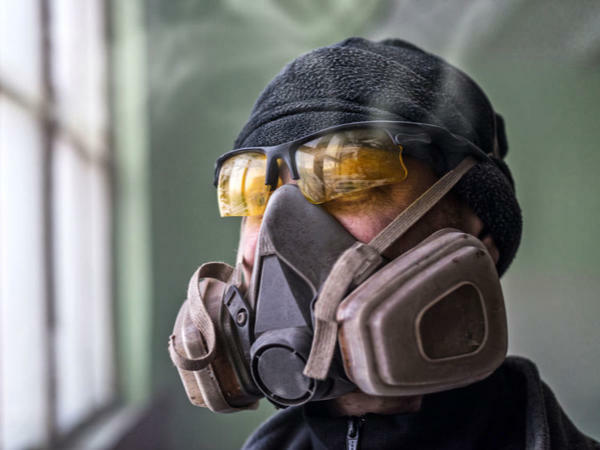 When using insecticide dusts, always use chemical-resistant gloves, protective goggles, and a P95 organic vapor respirator with a dust filter. If the roaches are at your workplace. In most states, any pesticide applications made in the course of a person's employment or business are considered commercial applications, and require applicator licensing, insurance, and so forth. This applies even if you use over-the-counter chemicals. If the infestation is severe. For every roach you see, there can be hundreds that you don't. Do you know how to find them? If you (or someone else living in the home) have asthma, allergies, or other respiratory conditions. Cockroaches and their by-products are powerful allergens and can trigger asthma attacks (as can many pesticides). If you live in a multi-unit dwelling. Apartment houses, co-ops, and condos should be treated together for the most effective cockroach elimination. If you just can't be bothered doing it yourself, or if roaches just gross you out. Assuming that none of the above apply, let's look at the steps to effective cockroach treatment. The first step in addressing any cockroach problem is sanitation. This means doing a thorough clean up to remove sources of food, water, and harborage. 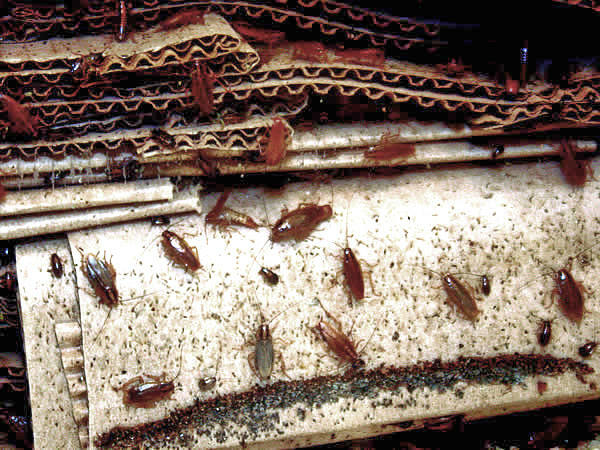 Be especially careful about things like paper bags, cardboard boxes, and other refuse that can provide roaches with harborage (that is, protected places to live). Harborage is one of the essentials that cockroaches need in order to survive. Removing and discarding old paper bags and cardboard boxes can go a long way towards solving a cockroach problem. If the cockroaches are in your kitchen, consider storing all food that's not already in airtight packaging (such as canned foods) in heavy-duty zipper-type bags (freezer bags will work) or airtight storage containers. Doing so will both deny the roaches food and protect the food from contamination. If you're dealing with brown-banded roaches in an area such as the living room or bedroom, thoroughly clean and vacuum the room to remove any food scraps or crumbs, and try to avoid eating in there for a while. You should also eliminate any sources of water, for example, by fixing dripping pipes under the sink. To sum it all up, sanitation means doing whatever you need to do to deny the roaches their three absolute necessities of life: food, water, and harborage. The next step is to use non-chemical methods to quickly reduce the population. One of the easiest and best ways to do this is with sticky traps (commonly called "glue boards" by those in the know). Use a little tape or a thumbtack to attach the glue boards to surfaces in cabinets, under the sink, or in other infested areas. Use rubber gloves when handling glue boards that have roaches on them. Roaches carry germs that can cause all sorts of diseases. You don't have to use any particular type of glue board. Use the cheapest ones you can find. There's very little difference between different brands of glue boards. Just make sure you buy enough to frequently change them. Another way to quickly reduce cockroach populations is with a HEPA vacuum cleaner. Don't use an ordinary household or shop vacuum cleaner for cockroach removal. Cockroaches and their by-products contain allergens and pathogens (disease-causing organisms) that can be spread through the air by non-HEPA vacuum cleaners. After sanitation and population reduction, chemical treatment should be used to kill off the remaining roaches. 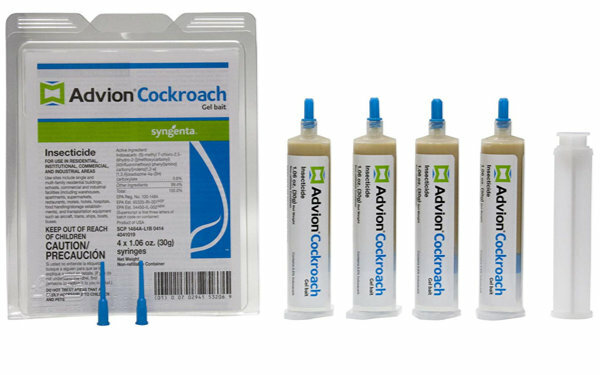 The two easiest cockroach control products available to do-it-yourself cockroach killers are injectable gels or bait stations. Gels usually work better because they're more palatable to roaches when freshly applied; but bait stations can be just as effective, but somewhat slower, if properly used. Bait gels generally come in tubes with a built-in plunger, and one tube contains enough bait to treat an average apartment several times. Precision, not quantity, is the key to applying cockroach gel baits effectively. Use tiny dabs placed in cracks and crevices where you have seen roaches, shed skins, droppings, or oothecae (egg cases). Make sure to get the gel into hard-to-reach places such as the underside of the kitchen sink where it attaches to the counter. Also drip some bait into the wall voids behind wet areas through the openings around the pipes. Use only small dabs of gel bait as specified by the label. Using more bait than needed is sloppy, illegal, and may actually reduce its effectiveness. Ideally, the bait should be placed where you can't even see it unless you know where to look. Special care must be used when applying bait gels in places where food is stored, prepared, or served; in dresser drawers, night-tables, or other places where clothing is stored; or in desk drawers where the user's hand may come in contact with sloppily applied bait. In these situations, consider using bait stations instead. They're easier, safer, and less likely to stain stored clothing. 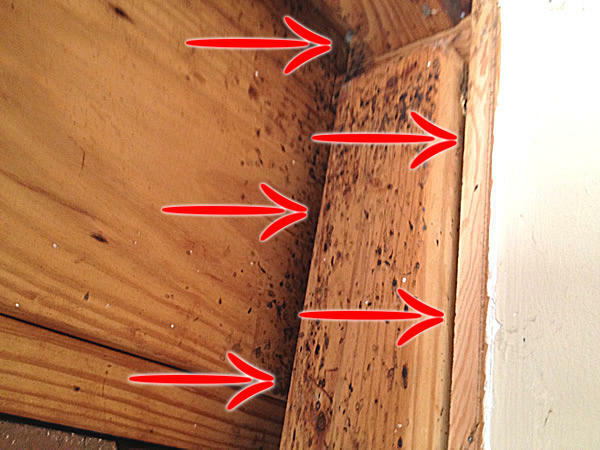 Cockroach bait stations should be fastened as close as possible to where the roaches are hiding or traveling (for example, right next to a crack inside a cabinet or a pipe chase where roaches, oothecae, or droppings have been sighted). When a bait station needs replacement, the new one should be placed exactly where the old one was. Cockroaches leave pheromone trails to existing sources of food, so placing the new bait station where the old one was will help roaches find it more quickly. There are many variables affecting the effectiveness of cockroach treatment. After all, these critters have been defying our efforts to eradicate them for a long time. So if after following the steps above, you don't see a reduction in roach activity within two or three weeks, then your infestation may require the services of a professional exterminator. When using any pesticide, always read and follow the label instructions and observe all safety precautions relating to use, storage, and disposal.